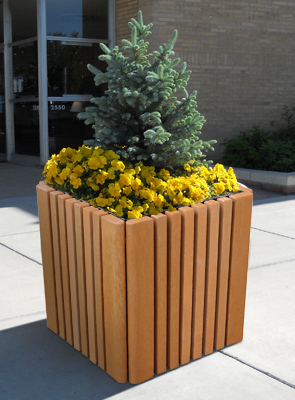 This unique recycled plastic planter features maintenance-free, 100% recycled plastic 2" x 2" and 2" x 4" bullnose slats pre-attached on four panels for easy assembly. Footprint measures 22-9/16" x 22-9/16". Matching bench with backrest, modular bench attachment, and trash receptacle available for a complete outdoor space arrangement. Available in the recycled plastic color options as shown below.